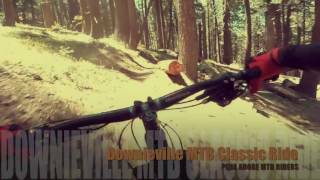 The Downieville Classic ride. Get your car/shuttle ride to the top. The route skips Sunrise Trail and starts at Butcher Ranch trailhead. Expect snow in places through May. Start with Butcher Trail, which leads to either Third Divide Trail or Second Divide Trail ( Third Divide is faster and shorter than Second Divide; Second Divide is longer, but in my opinion, not as much fun as Third Divide), which leads to First Divide Trail, followed by a fire road, then a road ride return to Downieville. The ride is a point-to-point that needs a shuttle or car ride to the Butcher Ranch Trailhead. This ride starts with the Butcher Trail, where you can expect speed, loose rocks, creek crossings, tight switchback descending turns, and perhaps a few hike-a-bike sections, depending on your skills. Just after the final descent, you'll cross a bridge over a creek and begin a doubletrack climb. Half way up this climb, there is a fork. Left (and descending) is Second Divide and right (and continuing to climb) is Third Divide. Second Divide is longer, but not as fast (or in my opinion as fun) as Third Divide. Third Divide is mostly smooth singletrack, with only a few small technical sections. You can really get some speed on this trail. Third Divide leads to a fire-road descent for about a mile. If you've had enough, you can continue along the fire road back to Downieville. If not, you can drop into First Divide (upper portion). Look for a little sign that says "Trail" with an arrow. First Divide is a relatively flat/descending singletrack and is, at times, quite narrow with a rock face wall on one side and a drop off small cliff on the other. Watch not to clip your bars on the rock faces. First Divide (upper) meets up with a fire road, which you can take back to Downieville, or cross and continue along First Divide (lower) for more of the fun rock face/edge narrow singletrack. 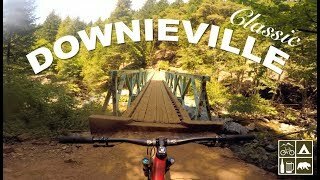 Once you emerge to the paved road, follow it back to Downieville. Fast and smooth section of Third Divide Trail. Chillin' on the first bridge.